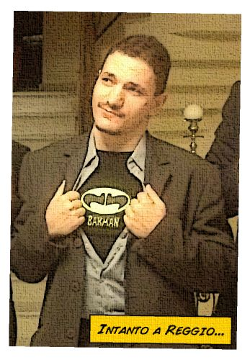 I am Roberto M. Cananzi , more often known as the BaK . After a course of classical studies I started working, from a very young age, in the IT sector . The study of several programming languages ​​follows the writing of a framework (Universalis) that, allowing the introduction of graphics on dated computers equipped with the old DOS, will be the basis of many self-produced business programs in that period. After graduation I dedicate some years to volunteering through the assistance of seniors and children in social difficulty , as well as participating in the distribution of food in the difficult areas of the city. By the end of the 1990s I started to be interested in open source as an ethical and free alternative for the use and diffusion of technology. In 2002 I created the IRC channel #ReggioCalabriaon the Azzurra network, a real-time chat of which I write a reference site and forum. The community of the channel grows and becomes a meeting point for reggini and emigrants. In various districts of the city, commercial activities exhibit the chat leaflet. Meanwhile "the Betty" (female figure representing the city in the chat logo) also arrives on the website of the network that certifies #ReggioCalabria as the official channel of the city and one of the most visited of the network. In 2004 "I will give" the project to the community itself, which I feel is concluded, including the forum that has become an innovative online space for the promotion of events in the city and the organization of "meetings": meeting events that bring back the cordiality live of the chat. to continue in their sales and assistance, as well as start research projects and promotion of open source software. The experience gained in programming led me to work mainly with companies and in business areas, in particular regarding the migration from commercial software to free software. 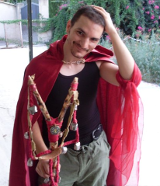 In 2005 I wrote ARS (All-purpose Roleplaying System) , a universal system for role-playing games. Free and essential (a single page flyer against the cumbersome manuals to which the sector is accustomed to confront), ARS finds its ideal diffusion in the internet environment and creates in the city a group of players and enthusiasts who regularly meet in different game nights. The appointments of the game are thickened, alongside the board game also events entirely original and unpublished based on the manual Live: every month many people find themselves to "live" for one night their character in a real event from I live. From this moment on the role play in Calabria will be identified (among players and magazines in the sector) in the ARS that continues its diffusion. In 2007 I took part in the anti-piracy table on the web, siding in favor of freedom of expression and dissemination of artand promoting the importance of self-produced and funded art. In 2008 I get a land with a disused ruin, in a neighborhood of the suburbs of Reggio. Starting from the connection of water and electricity, to develop entirely innovative solutions based on recycled and environmentally friendly materials, the "House of ARS" structure takes shape and becomes the seat of the first artistic group of Reggio Emilia: the collective ARS . The collective exploits the ARS theatrical improvisation events to gather art and show lovers, offering a free space where they can meet and produce their ideas. 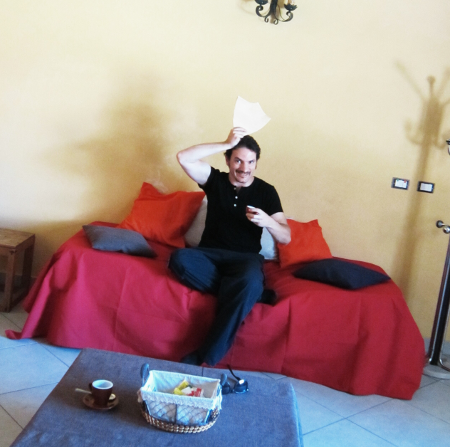 In 2009 the House also became the first coworking space in Reggio: a creative workshop in which, among other things, all the stage settings and costumes take shape. In the same year it is the first structure to host a cosplay event in Calabria , offering the self-produced cosplay workshop . 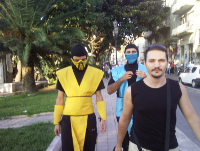 In 2010 the cosplay produced here will win the first regional competition in the sector. From 2008 to 2010 the collective ARS participates in the production of various videos and initiatives in the area. In 2009 the House is the first Reggina structure to offer a free internet connection and is the first to host a computer network entirely based on open source systems . on March 25, 2010, in what will be remembered as a dark moment of information and freedom of expression in Italy, the House is the only Calabrian structure to face the danger of freedom of information and to propose the web as an alternative to traditional media , also hosting the national event "Rai per una notte" . On the August 2010 the collective ARS is frozen and I will continue to propose initiatives just like the BaK. 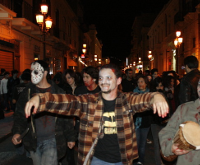 On 10 October 2010 I organize the "Zombie Walk @ Reggio Calabria" : a fashion show in the city center followed by an entire evening of concerts and art exhibitions. Event dedicated to the desire for urban rebirth, through the metaphor of the zombies, and that will collect hundreds of people each year. Ironically, during a normal control of the SIAE, an official defines the structure "House of BaK" and with this name will be recognized in the years to follow. Since 2010the House will be established as a unique place of art, outside of any political and commercial context, offering space to events of great importance in the artistic context of the south , hosting artists ranging from the popular to the punk, with a monthly calendar of events that include all the arts, from the cinema to the theater through concerts and literary readings. In 2011 I am called by the Student Union and Legambiente in organizing the reggina stage of the national project "Young people change the changing climate", bringing hundreds of guys to dance a conga right in the city center. The event aims to raise awareness on the problem of global warming and is followed by a photographic exhibition set up on a special train that runs throughout Italy in the following weeks. The script weighs less than 4 kb and is compatible with any fixed and mobile device. The site ilbak.it is put online in 2011, which collects, in addition to a blog with all the news about my activities, a newsletter through which every week members receive an email that reports events and information on what I organize. In just a few weeks, registrations exceed the thousands of active email addresses. A few months later, a small online store was activated, selling gadgets strictly produced at zero kilometers , bringing the young local excellence to work for the first time on a brand designed for the web. It will be among the first Italian companies to accept a cryptocurrency thanks to the transactions via protocolBitcoin . In 2013, some short stories of mine were published in the CENTOPAROLE literary project, gathering consensus messages between the other writers and the readers of the book. In November 2013, "Tales of the City of Gry" was published on the web . The story takes place in the imaginary city of Gry, which for years has been plagued by a bloody war with a nearby city. But among the ruins of the city so many lives are forced to live and survive the war, including the life of the young Ayrilis, a curious and enterprising girl who dreams of being able to escape from Gry and know the world read only secretly on some books. The entire proceeds from the sale of "The stories of the city of Gry" is donated to the ONLUS "School of Peace" to finance a humanitarian expedition to the borders of the Syrian territory , afflicted by the war. On 25 November 2013, on the occasion ofworld day against violence against women I have the opportunity to hold a reading of my poems in piazza Italia, in the center of Reggio Calabria. It 's just one of the stages of literary reading with which I bring in public places and spaces the poems I wrote over the years, published through the site and taken from various sites and magazines in the industry. 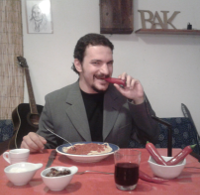 From June 2013, the habit of organizing an open and shared dinner at the House every week becomes a radio program: La Cena dei Reggini resumes the dinner held at the House every week for a long time and brings via radio, video and podcasts, the life of the House to the homes of many curious around the world. The format is written by me and presents itself as a container inside which diners who really take part in a dinner can comment on news, present their ideas or artists can participate as guests to share their art. The Dinner becomes a popular destination for all independent art that wants to present itself on the web but not only ... Over the years it will also host major issues such as the Syrian chemical weapons disposed of in the Mediterranean or the voice of troubled entrepreneurs. On the sidelines of the undisputed role of entertainment, La Cena dei Reggini every week collects some food that is shared to become a real dinner for families in trouble . First example of food sharingin the city, it allows for the first time access to food outside of political or religious flags . In August 2014, "La Gilda degli Artisti" fund , an association that wants to follow the events organized by me and bring the philosophy that has moved the House so far even beyond my single person . In a few days La Gilda gains associates and becomes a meeting point for Reggio and other artists. Using the House as a venue, La Gilda manages to create a proactive and productive environment of art, in which to offer space and advice to independent artists freely and outside any political context. The "La Voce del Niubbo" project is also born in the guild of the Guild, a poster / magazine that, in addition to reporting the dates of the events organized by me and the Guild, illustrates the activities organized the previous month and the use of money collected through the various initiatives. The great adhesion of shopkeepers to this initiative makes it possible to reach the users of hundreds of shops every month. In 2015, "Portals" begins , a permanent exhibition of works of art designed by me in which each work is accompanied by a scansionable electronic codefrom modern smartphones. The code activates the work by providing information on the author and allowing him / her to communicate directly with him, so as to become a real interactive "portal" between the user and the source. For the first time the concept of exhibition of art has been revolutionized and the initiative gathers support in the press and also by the authors who continue to send their works from every part of the world. 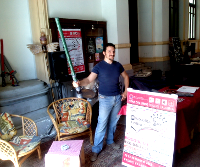 In May 2015 they are among the promoters of the Book Fair of Reggio Calabria. Inside the event with the stand of the Guild of Artists we create a real living room on the city course that for three days will welcome friends and visitors and in whichfor the first time a role-playing manual will be presented on a par with "classical" works as a mechanic for interactive narrative . In July I set up Mystery Room (formally Mystery Night: The Room), Calabria's first escape room . The gaming experience involves groups of players engaged in tests of ingenuity and skills useful to escape from the room in which the game takes place and which was set up for the occasion. Only help an artificial intelligence called Charlie simulated by a program created ad hoc. At the headquarters of the Guild of Artists set up the first space of city book sharing : a library open to consultation and distribution of books. The space within a few days becomes the official area of ​​the international project of BookCrossing, bringing to Reggio Calabria the project of sharing culture at no cost. In 2016, inspired by the continuous requests for hospitality at the structure, the Guild hosts visitors in a space used as a bed and breakfast . The success is immediate and in the first two years several hundred visitors from all five continents find the opportunity to see closely the activities and the environment of the guild seen previously only through the web. Even the hospitality experience is seen in a completely new perspective , offering guests a themed experience in which it is possible (albeit with all modern comforts) to live in a loft designed like the houses of the Middle Ages. For this reason the furniture is designed and made by me together with local artisans and the environment is not divided but develops in the unique space of a loft in perfect medieval style. In 2018 the guild is positively evaluated by both users and staff of the major tourism portals (5 stars out of 5 by the Airbnb portal and 9.4 out of 10 by the Booking portal) and reviews are often underlined by my ability to establish a feeling with guests and better manage a new concept of hospitality.